"...A tantalizing musical mix...Rich in many small artistic effects...He makes the guitar sing." "Lehmann-Haupt is a fantastic guitar player at home in folk, world, jazz, or classical genres." "John Lehmann-Haupt's aptitude is beautifully displayed on this disc." "...sensitive, complex, and frequently very beautiful." "John Lehmann-Haupt is a true guitarist. The sweetness and the bite of the guitar are unmistakable in his playing." "I admired the fastidiousness and harp-like registration of Lehmann-Haupt's transcription of a Prelude from Bach's Well-Tempered Clavier." John Lehmann-Haupt received his first guitar on his fifth birthday. His childhood exposure to the recordings of guitarist Andrés Segovia alongside those by country, blues, and jazz artists brought him an early understanding of the guitar's extraordinary expressive range. 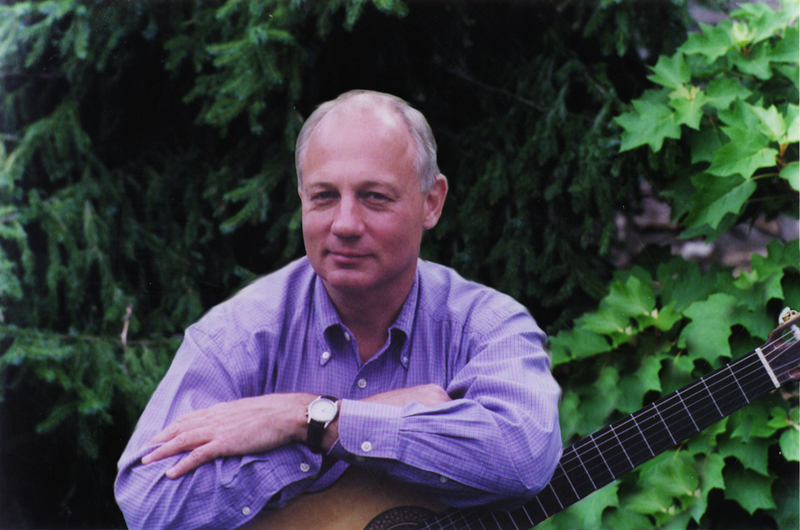 John's intensive study of classical technique, harmony, and musical structure gave him the tools to embark on the twin paths of classical interpretation and song arrangement he has dedicated himself to ever since. Over four decades of concert activity, John has found that his programs (usually with spoken commentary) appeal to an unusually broad audience, interweaving classical works with his fluently voiced arrangements of popular and traditional songs in a way that delivers both contrast and continuity. John has written extensively on music and the guitar. 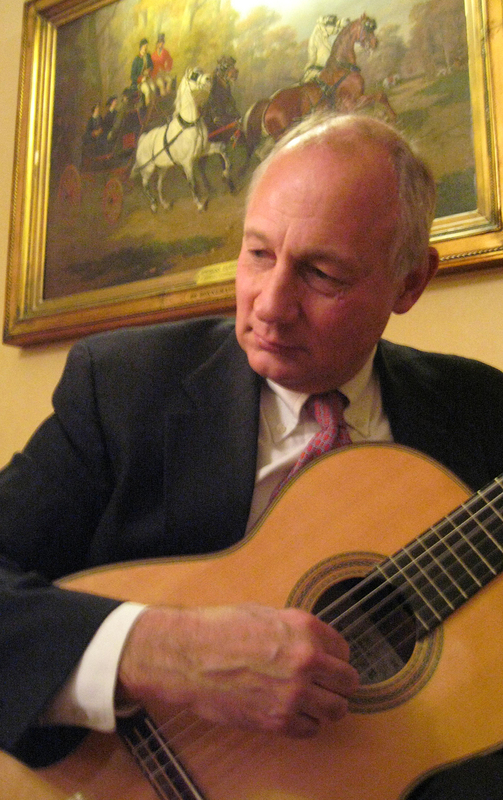 He was a staff instructor at New York's American Institute of Guitar from 1982 until its closing in 2008, and he has served on the Board of Directors of the New York City Classical Guitar Society since 2006. From 1981 until 1993, John performed nightly at New York's Windows on the World in the acclaimed Cellar in the Sky, atop the World Trade Center; the engagement was cited for musical excellence by the New York Times in 1986. 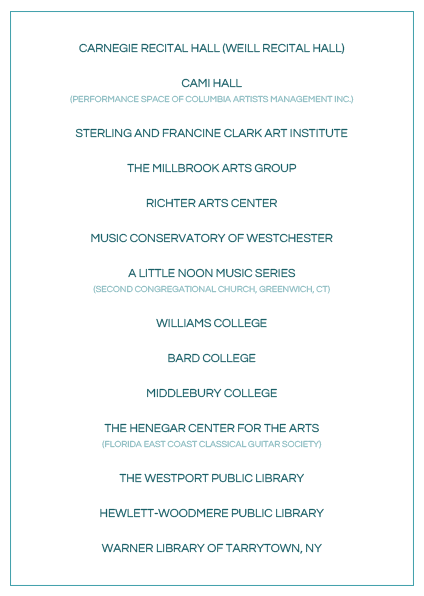 John has also performed in the New York homes of Tom Brokaw and Madeleine Albright, and in clubs throughout the Northeast. With his background in music, John began writing professionally in the area of music journalism, publishing articles in the New York Times and magazines including Acoustic Guitar, Strings, and Family Life. In the late 1990s he expanded his work to include corporate communications and promotional writing for clients including IBM, Bristol-Myers Squibb, the Multiple Myeloma Research Foundation, and wine importer Frederick Wildman & Sons. From 2001 until 2017, John was on the corporate communications team at publisher John Wiley & Sons, Inc., writing for internal and external audiences alike. "John is a very good writer and reporter. He is respectful of time and represents the written word and content extremely well and is a pleasure to work with." From a 2011 employee communications survey conducted by publisher John Wiley & Sons, Inc.; John was a member of Wiley's corporate communications team from 2001 until 2017. John contributed to the Wiley annual report from 2005 through 2011, drafting items such as these sidebars from the 2009 report. John conducted interviews and wrote several sections for the company history Knowledge for Generations: Wiley and the Global Publishing Industry, 1807-2007, such as this sidebar on the origin of the popular For Dummies brand. A short history of CrossRef, provider of an online reference linking service used by virtually every scholarly publisher. John also wrote CrossRef's annual report every year from its incorporation in 2000 through 2015. Excerpt from the 26-page promotional food/wine/travel booklet Etoiles, for wine importer Frederick Wildman & Sons. "You Gotta Work the Room"
In this 1993 New York Times article, John gives a musician's-eye view of one of New York's premier restaurants. Another New York Times article, on the resurgence of the acoustic guitar. An article on guitarist Eliot Fisk, for the magazine Acoustic Guitar. Fisk was very pleased with the article and had it posted on his Web site for several years. An article from IBM's Think Research magazine on the encryption of DVD content. Credited as editor, John wrote the text of the woodworking project book Marvelous Transforming Toys in consultation with master craftsman Jim Mackowicki, listed as author.